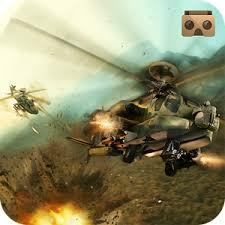 Get ready for an exciting VR experience in the first ever Virtual Reality Battle Helicopters. • The game is played exclusively with 360° head movements and shooting down the enemies is achieved only with your eyes! • No magnetic switch or NFC needed! • Challenge your opponent’s to beat their score on the global leaderboard! • It works perfectly with the new Google Cardboard and other similar VR glasses (headsets). • We recommend you to use headphones, for the best immersion.